I briefly caught a snippet about this on the local news programme for the Bristol area on the Beeb, Points West. The video was posted on Youtube by the girl’s mothers, Sharon Forbes. It show her daughter, Savannah, tackling a speaker from National Action, who clearly says he’s in favour of an all-White Britain. Sharon Forbes then says that her daughter’s mixed-race, and so what would he and his party do with her? Deport her? The Nazi doesn’t have an answer, except to say, ‘She looks White to me?’ He then claims that Britain has always been a White country, to which Forbes says, ‘No.’ Eventually, the youthful Fascist retreats, and the girl and her mother are clapped and applauded by the crowd. The Youtube video was put up four days ago, but it’s taken this time for the incident to make it on to the local news. I caught a glimpse of the interview, in which the girl and her mother stated that they didn’t care what was being said about them on the internet, it wouldn’t stop them doing what they had done. A spokeswoman for one of the local anti-racism organisations also said that where people challenge racists, even if they don’t necessarily win, racism goes down. As for National Action, this was founded as the ‘youth’ wing of the BNP. It’s members have turned up at Nazi rallies recently in Blackpool, Liverpool and other towns that could do without their presence. One of the group’s leading members, Jack Renshaw, appeared recently in the pages of Hope Not Hate, who had obtained the text of a speech he gave in February at a meeting of similar Rightists, ranting about how the current state of Britain was all the fault of the Jews, and stating that when Nazis like National Action gain power, they would be ‘irradiated’. This clearly constitutes hate speech within the meaning of the act, your honours, and Hope Not Hate have said they’ve pass their information on to the rozzers. National Action are genuine Nazis and anti-Semites, and it’s great that this one was tackled and humiliated in Bath. Jack Renshaw of National Action: Wants to start another Holocaust. It’s not just Renshaw and the Nazis of National Action and the Fascist Fringe that have been making viciously racist speeches and comments. Hope Not Hate also reports that Christopher Michael Baksa, the UKIP candidate for the Luddenfoot & Walsden ward in Calderdale has been making similarly disgusting comments on his Facebook page against Muslims. The organisation reports that amongst the rest of the racist rubbish, there’s a video posted by someone calling themselves Birmingham Crusader England, showing a fracas in Cardiff, which Baksa claims was the fault of ‘liberals’ and ‘migrants’. Except that it wasn’t. According to Hope Not Hate, the fight started when people started hurling abuse and drinks at a pro-Palestinian demonstration. Baksa’s page also contains some extremely vicious comments left by his readers directed as Muslims, demanding they leave Britain and predicting a civil war between Muslims and non-Muslims. As well as just plain, foul abuse. Hopefully, tomorrow the good folk in Calderdale will vote against Baksa and his nonsense, and give their considered electoral support to anyone but him. While the media has been following spurious and mendacious accusations of anti-Semitism made against Ken Livingstone and Naz Shah, the real anti-Semites on the British Fascist right have been making speeches demanding the very real, and murderous persecution of the Jews. Last month, the anti-racist, anti-religious extremism magazine and blog, Hope Not Hate, reported how Jack Renshaw, one of the leading lights of the Nazi ‘youth’ organisation, National Action, had made a bitterly anti-Semitic speech at a rally in Blackpool. “Hitler was wrong… he showed mercy to people who did not deserve it…we have hindsight.. we see what the Jew did when offered mercy. We need to learn from the mistakes of the National Socialists. We must not show the Jews any mercy. He is nature’s social vermin. He needs to be irradiated”. He then also called for a “Holy War”. As well as being repulsive, this clearly violates the laws against hate speech and promoting racial hatred. It’s also incitement to violence to people, who very often have a long history of extreme violence against Jews, Blacks, Asians, Leftists, anti-Fascists and just about anyone or everyone who isn’t them. Hope Not Hate state that they’ll be passing this on to the police. Hopefully, they’ll take action and Renshaw will have at least a little talk with Inspector Knacker. 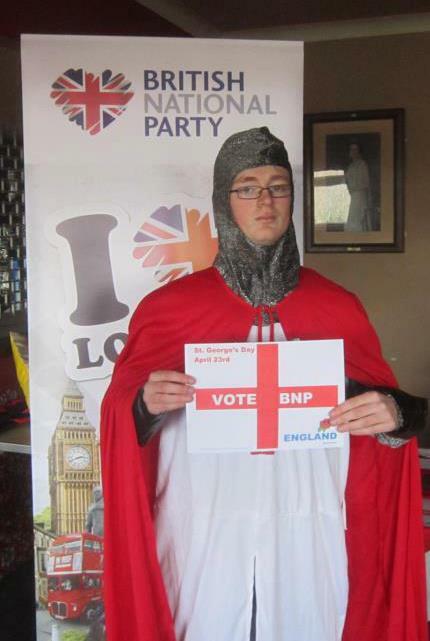 As well as being a vicious anti-Semite, Renshaw has also tried to promote Fascism by dressing up as St. George. Apart from looking thoroughly ridiculous, this kind of overlooks the fact that the original St. George was a Roman squaddie in what is now either Turkey or Syria. He’s also the patron saint of various other nations, including Georgia in the Caucasus. The peoples of that part of the former USSR were the subject of Russian racism, which used to refer to them disparagingly as ‘Blacks’ because of their darker complexions and hair. Somehow, I don’t think Renshaw would appreciate the irony of being a Fascist dressed as someone from the Middle East, whom he and his National Comrades would sneer and despise for their racial origins today. Remember Joshua Bonehill? Tom Pride over at Pride’s Purge blogged about him a year or so ago. He’s the Hitler wannabe, who boasted at he had at least 20,000 + followers on Twitter. He was trying to set up his own Far Right party and was appealing for men to join his ‘Leader Guard’. This was to be the new Praetorian guard to march with and protect him as Fuehrer of the new British extreme Right. Mr Pride was alarmed as one of his Twitter followers was a British army colonel. I thought that Bonehill and his dreams of Nazi Fuehrertum were so bonkers that it had to be a wind-up. Surely someone, who was so obviously trying to be early 21st Century’s Britain’s own Adolf couldn’t possibly be serious? Last week was Holocaust memorial week, and the country remembered the liberation of the Nazi Death Camps and the almost unbelievable horror that was perpetuated there. The surviving inmates, some well into their nineties, told their stories. At the same time this was going, Bonehill was planning a Nazi march against the 20,000 strong Jewish community of Stamford Hill in London. He claimed this was a protest against the ‘Jewification’ of Britain, and particularly against the ultra-Orthodox Haredi community in the area. He claimed the shomrim, a neighbourhood-watch type organisation set up in the Stamford Hill to protect Jewish residents, was actually a religious police. ◾ Bonehill attempted to organise a demonstration in Cardiff last year under his National British Resistance Political party. The party consisted of two other people, one with learning difficulties who he scammed for £500. He did not show up, neither did his friends. ◾ His Woolwich Strong t-shirt sales scam saw him allegedly net over £1000. According to our sources, none of the money has been given to the Lee Rigby fund. A grand total of £5 went to Help for Heroes and then rest he put down as administrative costs. ◾ Bonehill’s online popularity seems to stem from spending lots of money buying Facebook likes and Twitter followers from countries such as Pakistan, India and Turkey in order to make himself look more popular. Much of that money went down the pan recently when both Twitter and Facebook kicked him off their networks. ◾ According to locals, Bonehill is allegedly banned from a large supermarket chain nationwide for getting drunk and trying to defecate in the aisle of the cosmetics department, before being forcibly removed by security guards. We cannot corroborate this story ourselves but a number of witnesses have confirmed the story. ◾ Bonehill has a conviction for using his Conservative party membership card to break into a police station and steal uniforms. When caught he assaulted a police officer. ◾ He is allegedly banned from the Mermaid pub in Yeovil after one of the bar maids had him up against the wall by his throat and threw him out for reasons we are unable to disclose. Again, a number of local people have confirmed this. ◾ Drink seems to be a major factor in Bonehill’s life according to most people we spoke to which explains the online bravado exhibited. ◾ He is awaiting sentencing on five charges of harassment and two charges of malicious communications arising from undertaking lengthy and concerted campaigns branding as paedophiles, people who disagreed and outwitted him online (no hard task). 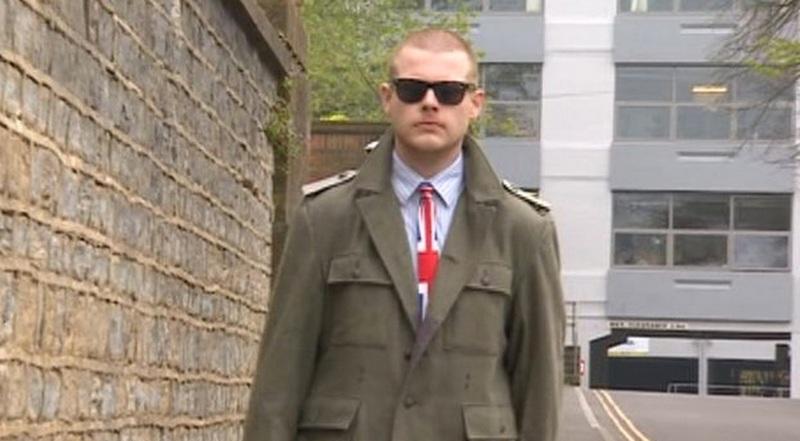 ◾ After pleading guilty to a hoax which claimed the Globe Pub in Leicester has refused service to a soldier, the BBC described him as a ‘moronic troll’. Bonehill is a nasty piece of work, and his organisation is particularly revolting at a time the Jewish community here in Britain and Europe generally is particularly under attack. There is a wave of anti-Semitism rising in Europe, which many observers have described as the worst Jews have experienced since the 1930s. The most obvious example of this was the attack on the customers and staff at a French Jewish supermarket by an Islamist gunman following the attack on Charlie Hebdo the week before last. It should be mentioned here that 15 of the shopper and store clerks were hidden by a Muslim security guard, an act of courage and humanity, which should be given all due credit and respect. It clearly shows that, despite the claims of Islamist terrorists, very definitely not all Muslims share their violent and genocidal racism. Bonehill, however, isn’t alone on the Far Right in turning to anti-Semitism to shore up their dwindling numbers. According to Hope Not Hate, Jack Renshaw, a young nipper in the BNP is another open Jew-hater. In one of his communiques, he ranted about the Jews encouraging racial mixing in order to destroy the White race as part of a plan to enslave gentiles. It’s the classic Nazi conspiracy fantasy. See the article Big trouble for Little Jack at http://www.hopenothate.org.uk/blog/insider/big-trouble-for-little-jack-4170. Not to be outdone, Gary Raikes of the New British Union is also dragging British Fascism firmly back to the 1930s. His organisation actually has a uniform of black shirt and sweatpants. 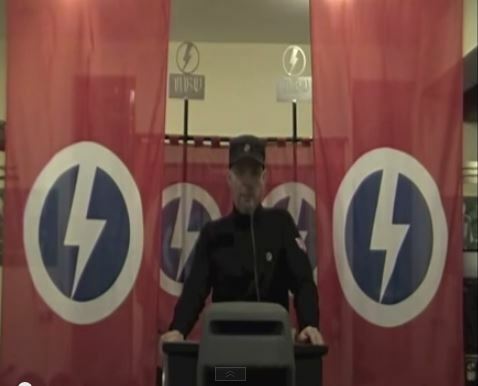 He himself appears to hold his meeting in full quasi-Nazi regalia, complete with military style cap and surrounded by flags, all emblazoned with the same lightning bolt motif Oswald Mosley used for the British Union of Fascists. 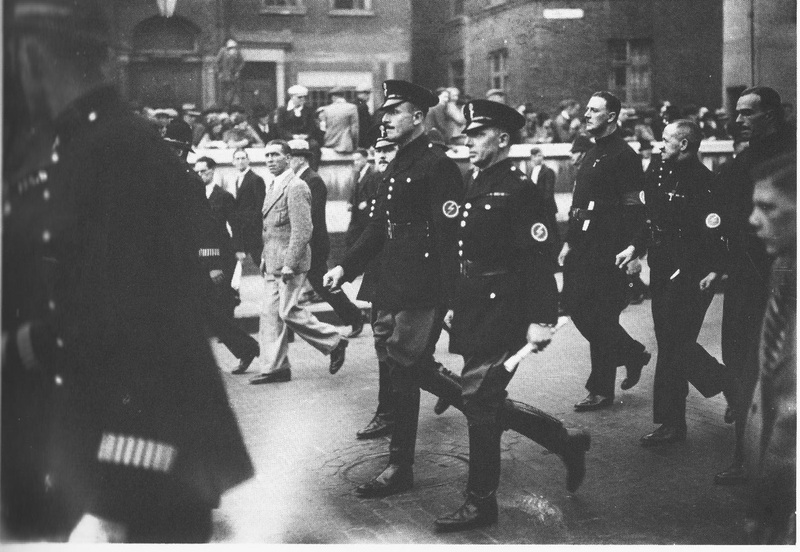 Oswald Mosley: Old Fuehrer of the BUF on the infamous march in Cable Street. These tactics are likely to backfire massively on Bonehill, Renshaw, Raikes and the other stormtroopers. While there still is anti-Semitism in British society, there isn’t mass support for a blatantly Nazi party. The horrors of the Third Reich and the Second World War effectively destroyed any mass support Mosley’s BUF may have had. And even before the outbreak of the Second World War, they were struggling to retain their membership, partly due to its notoriety for using violence. Richard Thurlow in his book, Fascism in Britain: A History, 1918-1985, makes the case that the Far Right in Britain only survived into the post-War period by making Black and Asian immigrants the targets of their hate, rather than the Jews. Matthew Collins in his account of his years in the BNP, Hate, records private conversations with some of his fellow stormtroopers, who confided they didn’t understand the hatred of the Jews. Even so, members of the National Front were infamous in the 1970s for dressing up in Nazi uniforms. One book I read recently by an American historian of the Far Right argued that Fascists, by and large, were never successful as mass movements. In Germany, Spain and Italy they owed their accession to government through deals made with other, established right-wing groups and parties, who hoped they could use these movements to bolster their own position. As for the uniforms, I understood that the wearing of paramilitary, political uniforms had been outlawed in the 1930s. Over in France, one of the main Fascist organisations, the Croix de Feu, found their vote actually increased when they gave up wearing them and began instead to look like an ordinary, mainstream political party. We shouldn’t be complacent. Although the BNP has effectively collapsed into warring splinter groups, the rise of UKIP shows that xenophobia and racism is still an effective political force. Nevertheless, the return of the various Fascist grouplets to anti-Semitism and paramilitary costumes is likely to repel far, far more people than it attracts. This isn’t the image of a brave, new political force threatening to sweep through Britain. It’s the return of an old, collapsing ideology back to its original, murderous and discredited position. Joshua Bonehill comes from Yeovil, and a few of the good people of that great Somerset town are so ashamed of the disgrace he’s bringing them that they’ve formed their own anti-Bonehill group on Facebook, Yeovil Against Bonehill.